On February 12 at approximately 6:40 p.m. Calcasieu Parish Sheriff’s Office deputies responded to call at a local hospital in reference to a possible cruelty to a juvenile. Upon deputies’ arrival they were advised by hospital staff that a 4 month old baby was brought in with a brain bleed. 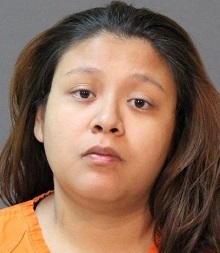 During the investigation, detectives spoke with the babysitter, Kristian A. Rosas, 25, 1260 N. Highway 171, Lake Charles, who was babysitting the 4 month old at her residence. Rosas admitted to detectives that she intentionally struck the baby’s head against a wall. She was arrested and booked into the Calcasieu Correctional Center and charged with 2nd degree cruelty to a juvenile. Judge Ron Ware set her bond at $80,000. The baby was transported to a hospital out of town and is currently listed in serious condition.